New undercover footage reveals vicious animal abuse at one North Carolina slaughterhouse. Warning: Video contains disturbing footage. Compassion Over Killing (COK) conducted the investigation at the Mountaire Farms chicken slaughterhouse in Robeson County in March and April. The footage, released on Monday, reveals stomach-turning cruelty toward live chickens and several violations of anti-cruelty laws. Birds are violently thrown around and slammed into leg shackles, and punched while they're held helpless. Live sick or injured birds are thrown onto piles of dead birds like refuse. One worker even rips out a handful of a chicken's feathers to throw at another worker. The brutal footage is all the more compelling because it could be the last undercover video of its kind: It was released in response to North Carolina's pending ag-gag legislation. The bill would make it illegal for anyone who witnesses animal abuse at farms to document it through audio or visual recordings, making investigations like this one impossible to conduct. 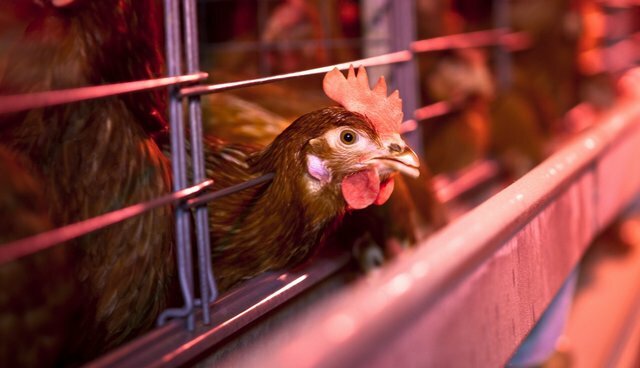 "North Carolina's chicken industry is desperate to cover up its rampant animal abuse, which is why it's so feverishly working to enact this law," Erica Meier, executive director of COK, said in a statement. "Rather than doing the right thing to stop these abuses from happening, the North Carolina chicken industry is simply trying to prevent the public from seeing it and punishing anyone who would expose it." HB 405 was passed by the House last month, and its counterpart, SB 433, is currently before the Senate. "If the pending ag-gag bill .... - supported by the North Carolina poultry industry - becomes law, this video may be the last honest look the public will get behind the closed doors of factory farms or slaughterhouses in the state," COK said in a release. And unfortunately, abuse like this is all too common. Just last year, a COK investigation at a Pilgrim's Pride farm in North Carolina showed live chickens being dumped into mass graves and left to starve or suffocate. Also last year, a Mercy for Animals investigation into a North Carolina Butterball hatchery showed workers grinding up newborn turkeys alive and refusing treatment for injured birds. COK is asking viewers to sign a petition asking North Carolina Gov. Pat McCrory to preserve transparency in farming and veto the bill if it reaches his desk. North Carolina residents can also contact their local state senators and ask them to vote against SB 433. You can find your representatives' contact information here.